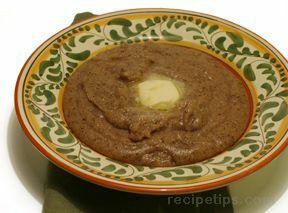 This form of the northern Italian cornmeal-based dish trades the bright yellow of the more typical polenta for an earthier, tan-colored version. Put 1 - 2 inches water into the bottom section of a double boiler and bring to a simmer. Heat 4 cups water to near boiling and add to top part of boiler. In a separate bowl, mix corn meal, buckwheat and salt. Whisk this mixture gradually into the hot water, stirring constantly to prevent lumps. Cover and cook, stirring occasionally, for about an hour or until the mixture has no raw taste. Mixture will be quite thick. Remove cooked polenta to a serving dish and top with a generous dollop of butter. TIP: a double boiler can be improvised by suspending a smaller saucepan inside a larger one, using a small jar, can or similar heat-proof object to keep the inner pan just above the water level in the larger pan.